Thanks to a bunch of canny coyotes doing what coyotes do, we have recently been reminded of the increasing presence of nature in cities and the human interaction with nature, both in New York City and other cities. And these lessons are applicable not just to the many cities where humans and nature interact, but also to how people relate in a social way with nature. New Yorkers are a funny group, at once impatient with any reminders that natural elements (such as the snow and cold of our recent winter) might impact their lives, but endlessly fascinated by nature in the form of wildlife and plants, appearing and surviving against all odds in one of the world’s mostly densely populated and built up cities. 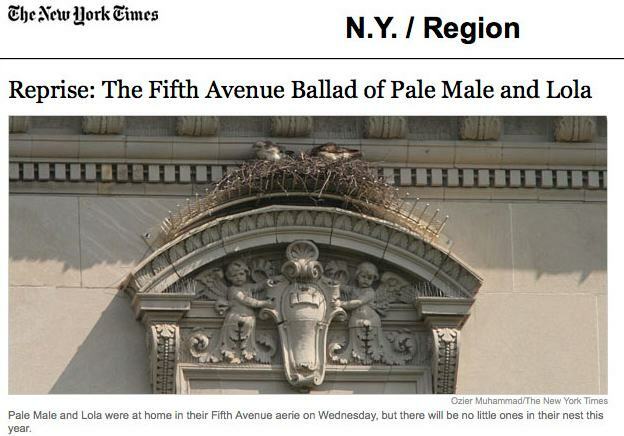 For followers of nature in cities, few can forget the saga of Pale Male and Lola, two red tailed hawks whose nest on a tony Fifth Ave. co-op was evicted, later to be replaced following a high-level diplomatic negotiation (that I was part of along with officials from the Audubon Society). The story of Pale Male transcended the small world of birders and entered the popular culture mainstream through several books for adults and children (Red Tails in Love, Pale Male: Citizen Hawk of New York City, The Tale of Pale Male, etc.) and movies. Over the last few months, coyotes have been appearing on an almost daily basis in New York City—one on top of a bar in Queens, another wandering through Manhattan’s Riverside Park, a third (or was it the second) trapped outside a restaurant in Lower Manhattan. 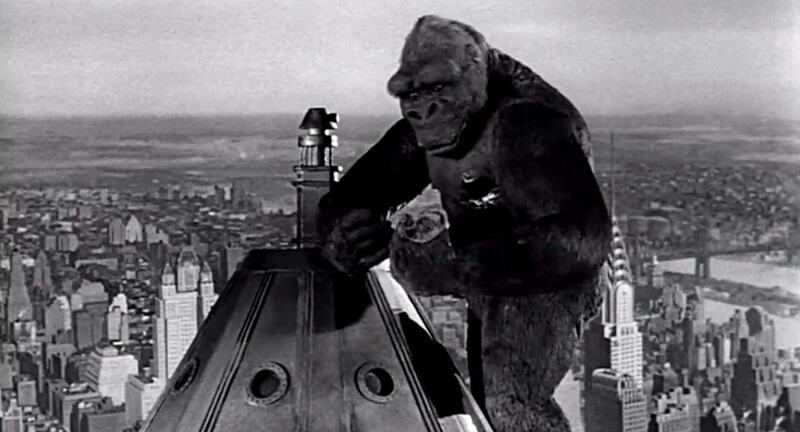 Each of those sightings, and the attendant police chases replete with tranquilizer-dart armed sharpshooters of the NYPD’s elite Emergency Services Unit, becomes fodder for the nightly news and daily newspapers (with the word “wily” used almost every time). In fact, coyotes have been in parts of NYC for decades, and now are common in cities across the country. 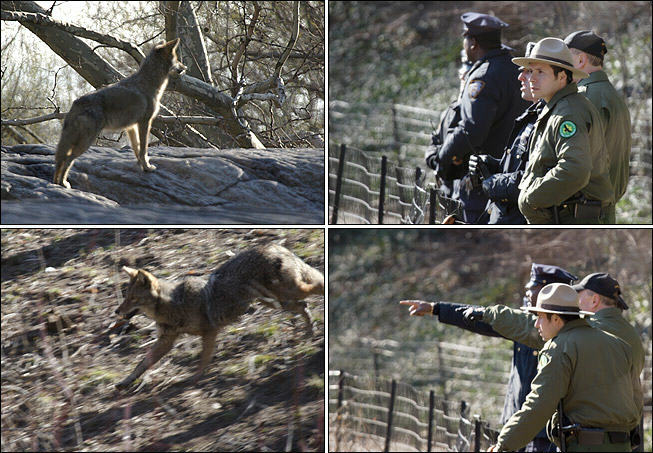 Hal the coyote being tracked by NYPD and Park Rangers. Photo: NY Times/ Paul Kreft. But the fact that those stories are still prominent on the news reflects New Yorkers’ fascination with nature. Kind of like the song “New York, New York”—if they can make it here, they’ll make it anywhere—city residents seem to identify with the survivor instincts of hawks, falcons, herons, and now coyotes. They also tend to love stories of “survivor” trees, such as the non-native Ailanthus altissima—the tree made famous in the novel A Tree Grows in Brooklyn—which grows from almost any surface. (I have even seen one growing out of a subterranean pit and up through a steel grate.) Threaten to cut down a tree, even if it is old and decrepit and likely to fall, and the neighbors will get up in arms (except for those who don’t like trees and the messy leaves they drop.) It may be no accident that nature has taken an ascendant role in New York City, where the City has pursued a deliberate policy of protecting and enhancing natural areas for more than 30 years, from starting a special unit concerned with natural areas in 1984 to the recent creation of the Natural Areas Conservancy. And while it might seem to people who have never visited New York, or only visited Manhattan, that New York is the last place for nature and humans to interact, in fact more than 50 percent of the parklands in NYC (City, State and Federal) are “natural,” according to the Trust for Public Land’s “2015 City Park Facts,” which also reports that among the 100 largest cities in the US, more than half have park systems that are more than 50% natural. 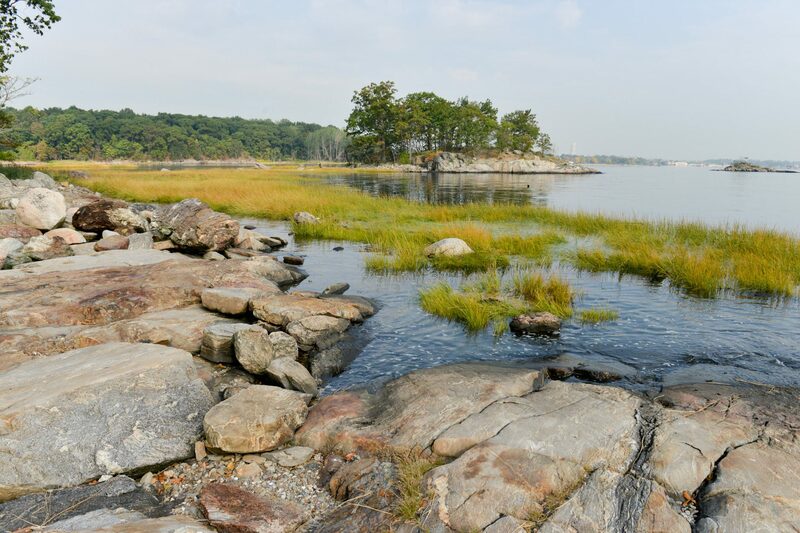 More than 1/3 of the parks under the NYC Department of Parks & Recreation (NYCDPR) are natural areas, and they have been under the care and study of the NYCDPR Natural Resources Group (NRG) since it was established in 1984—more than 30 years ago. So what do people actually think about nature in the form of parks, and what are the social interactions that people have with parks and nature? What do they look for when they go to a park, and how far are they willing to travel to get there? Are they looking for experience with nature that are active, as in fishing or birding, or passive, as in simply experiencing nature and finding a place of refuge there? Those were some of the questions asked by researchers from the US Forest Service (USFS), working with the Natural Areas Conservancy (NAC), a recently founded non-profit partner to NYCDPR and NRG, and with NYCDPR/NRG staff. 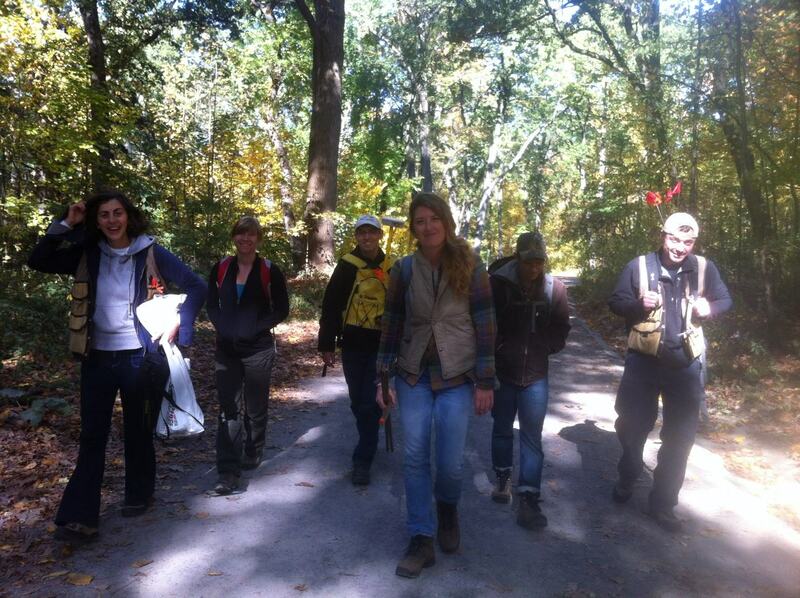 The study, led by USFS researchers Erika S. Svendsen, Lindsay K. Campbell , Nancy F. Sonti and Michelle L. Johnson, working with Bram Gunther, Sarah Charlop Powers, Helen Forgione and Clare Pregitzer of the NAC/NRG, was done through interviews with park visitors to NYC parks along Jamaica Bay in southern Queens and Brooklyn in 2013. “Reading the Landscape: A Social Assessment of Parks and Their Natural Areas in Jamaica Bay Communities” was issued in March of this year, and it contains fascinating documentation of how New Yorkers interact with their parks along Jamaica Bay, many of them natural, with tidal wetlands, coastal meadows and forests, and even freshwater wetlands. 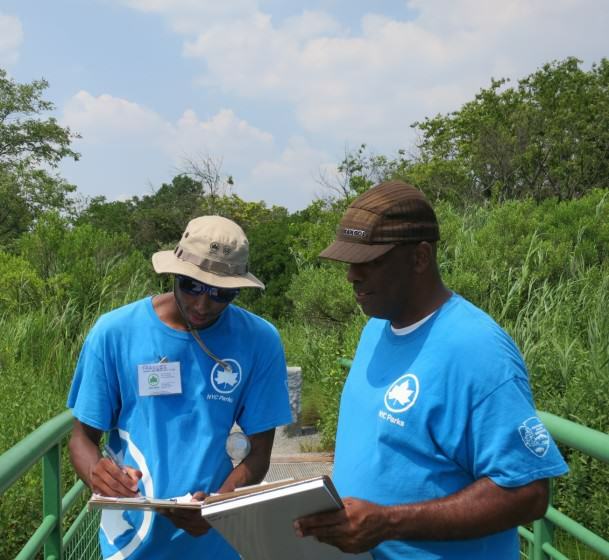 This “social assessment” was done in coordination with a city-wide ecological assessment of the 10,000 acres of NYCDPR natural areas conducted by the NAC/NRG. Study survey team getting to work. Photo: USFS, Social Assessment project. Interviewer team reviewing responses. Photo: USFS, Social Assessment project. 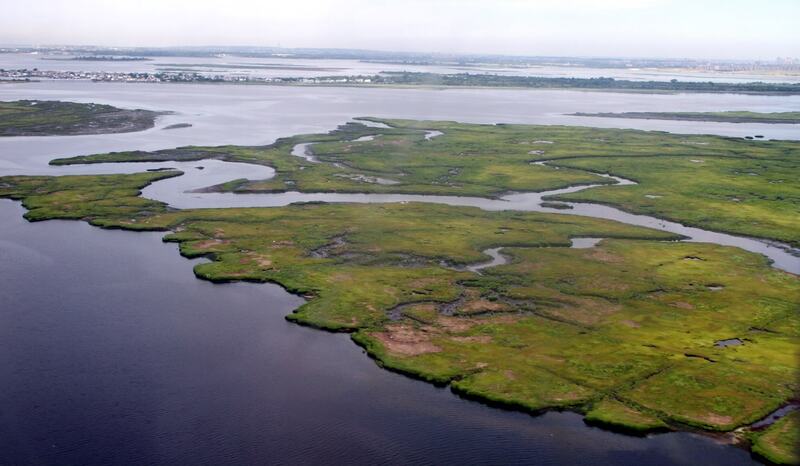 The study looked at 17 parks encompassing 2,140 acres along the edge of Jamaica Bay, whose adjacent neighborhoods have over 900,000 residents—more than many of the largest American cities. Those neighborhoods are also quite diverse racially, economically, and ethnically, including African-Americans, whites, Latinos and Asians. Field observations were made to document usage patterns, and the research teams conducted 681 in-person interviews with park users. 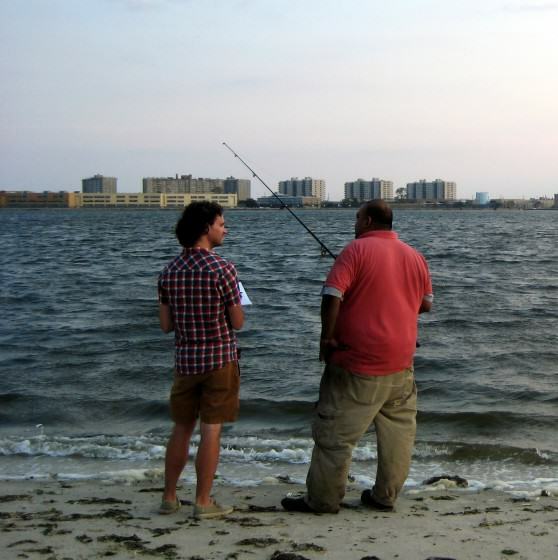 Site interview taking place at Jamaica Bay. Photo: USFS, Social Assessment project. Parks provide for an important number and range of activities that are beneficial to human beings. Parks serve as local resources, but are connected through their users to a wider network of outdoor sites. Parks are a crucial form of ‘nearby nature’ that provides space for activities, recreation, socialization, and engagement with the environment and supports social ties and place attachment. The majority of adult park users do not participate in formal environmental stewardship groups, but information about other forms of engagement and barriers to stewardship provides insight on potential for increasing stewardship. Although relatively few park users commented independently on Hurricane Sandy, those that did discussed the way in which parks and neighborhood residents were affected by the event. Of great interest to me was that city residents were willing to travel to get to these parks: though 37 percent of the people polled lived within ¼ mile of the park, 26 percent lived from ½ to I mile away, and 37 percent traveled more than I mile to get to the parks. In our work, the Trust for Public Land has found that most city residents are not willing to walk more than about ½ mile to get to a park. Mass transit options to get to most of the Jamaica Bay parks are extremely limited, which means that more than a third of visitors to these parks are traveling more than a mile to get there by driving, walking, or bicycling, primarily. So it’s possible that visitors are getting fit not just in the parks, but on their way to them. Jamaica Bay on descent to JFK. Credit: Erlend Bjørtvedt. The importance of the USFS/NAC/NYCDPR social assessment cannot be overstated. While many scientists are studying the life of nature in the city, and the roles of natural systems in providing ecosystems services, little is known about the social values of parks and nature and the way that people interact with them. Furthermore, many of the users are from economically underserved areas, who count on these parks for social connections to people and to the natural world.